A Quaker Approach to Research: Collaborative Practice and Communal Discernment grows out of a decade of experiments by Quaker Institute for the Future (QIF). During this time, the Institute has employed Quaker processes of communal discernment in research in the context of public policy, academic study, and community-based research. The guiding hypothesis has been that the methods developed by Quakers for Spirit-led governance could be adapted for Spirit-led research. Just as Quaker organizations seek to govern their activities through Meetings for Worship for the Conduct of Business, so too, the Institute and its associates have sought to plan and guide their investigations through Meetings for Worship for the Conduct of Research. 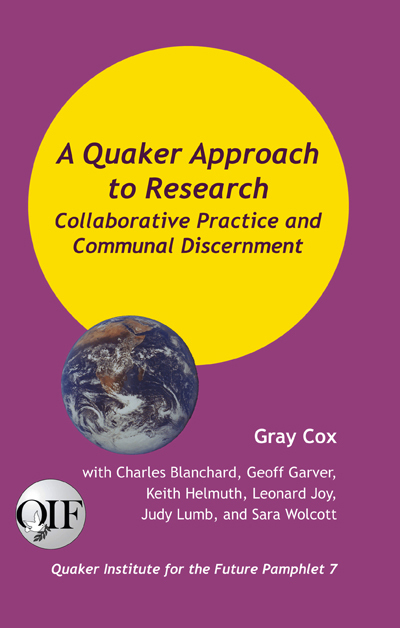 The aim of this pamphlet is to describe 1) the vision, theory, and traditions of practice inspiring a Quaker approach to research; 2) experiments with specific methods used; 3) initial results and findings; and 4) the key challenges and puzzles that remain. It further aims to explore the relevance of Quaker process when the participants are not Quaker or even religious. This pamphlet is itself the product of a collaborative process begun at the 2013 QIF Summer Research Seminar when Gray Cox proposed a Circle of Discernment on Quaker Epistemology and invited Friends to join him. The work on this pamphlet has been an especially rich and rewarding process in which all participants contributed in major ways, not only to the discernment process but also to the substantive text as well. Several participants in these QIF-sponsored experiments over the last ten years have shared their experience, including in secular settings. Lessons learned from these experiences are discussed. A Quaker Approachan be ordered from Keith Helmuth <ekhelmuth@mindspring.com>, QuakerBooks, Amazon, and local bookstores. QIF Pamphlets can be downloaded <quakerinstitute.org>.